Description: Ear problem so didn't dive on Monday. 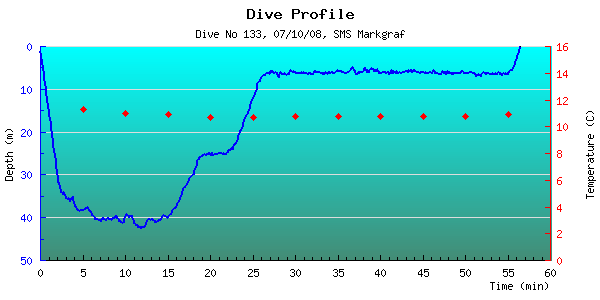 Ears behaved this dive and flew down the shot line to meet the rudders of the Markgraf. The battleship lies upside-down and we proceeded along the sea bed on the starboard side. Stopped to view a few casement guns built into the side of the boat, 5.9" bore. Deco at 6m instead of at 3m due to the swell. Completed air deco (equib of 13min at 3m) with a 7min safety stop. Played naughts and crosses and hangman with Stevie. Pressure In: 230/230 (12L twins) Pressure Out: 150/100 Gas Mix: Nitrox 27% mix.